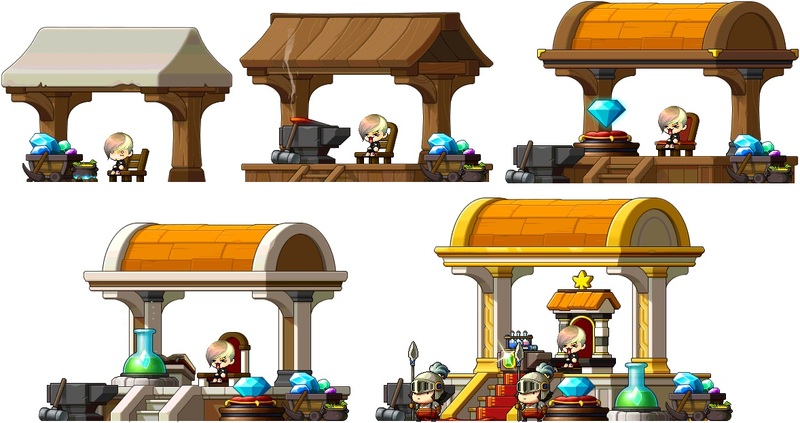 [Updated] Cash Shop Update for January 31 | Dexless, Maplestory Guides and More! Discussion in 'Maple Updates' started by Nexon, Feb 1, 2018. January 31 to February 28 in the Special Promotions > New Arrivals category in both Reboot and non-Reboot worlds. Lovely Shopper (F), Blue Moccasin, Shiny Shopper (M), Sweet Patissiere (F), Sweet Patissier (M), and Nagging Megaphone. On February 3-4, we will be having a special deal on Golden Hammer 100% Coupons! Double-click the coupon to receive a Golden Hammer 100%. Use your Golden Hammer 100% to add one additional upgrade slot to an equip item. Each item can have a max of 2 slots added. You have until 11:59 PM PST on February 4 (2:59 AM EST / 8:59 AM CET / 6:59 PM AEDT on February 5) to purchase these items. Make sure to move them from your cash inventory to your item inventory and use them soon! January 31 to February 20 in the Special Promotions > Limited Time category in non-Reboot worlds only. Click here for a list of the prizes you can find inside. New Year's Festivities (x1): Gives Weapon ATT/Magic ATT +40 to everyone in the map for 30 minutes. Happy New Year (x1): Gives Weapon ATT/Magic ATT +30 to everyone in the map for 15 minutes. Chinese Lantern Firecrackers (x1): Fireworks graphics appear and fill up the screen. Rapid-Fire Fireworks (x1): Gives you Weapon ATT/Magic ATT +20, Weapon DEF/Magic DEF +200, or Accuracy +400 for 10 minutes. Fireworks (x1): Fireworks graphics appear on the map that your character is in for 30 seconds. January 31 to February 13 in the Special Promotions > Limited Time category in both Reboot and non-Reboot worlds. Stay warm in winter with this knitted permanent outfit! January 31 to February 13 in the Special Promotions > Limited Time category in non-Reboot worlds only. Take home these adorable Terrier pets! Choose from Boston, Yorkshire, and Westie, or take home all three. The individual pet packages come with an equip to wear, yummy pet food to eat, a Pet Name Tag, and some useful pet skills and scrolls. January 31 to February 13 in the Special Promotions > Limited Time category in Reboot world only. Take home these adorable Terrier pets! Pick up Boston, Yorkshire, and Westie and let these little buddies join you on your adventures in Reboot world! January 25 (after maintenance) to February 15 (before maintenance) in the Random Rewards category in non-Reboot worlds only. The Great Gachapierrot has added lots of new items! Celebrate Lunar New Year with the Chinese Zodiac Cube Chair: Rat, Chinese Zodiac Cube Chair: Ox, Chinese Zodiac Cube Chair: Tiger, Chinese Zodiac Cube Chair: Rabbit, Chinese Zodiac Cube Chair: Dragon, and Chinese Zodiac Cube Chair: Snake. Track your diligence through your chair with Maple King of Diligence. As your diligence levels up to 25%, 50%, 75%, and 100%, the chair becomes fancier! Celebrate the season of love (and chocolate) with the Valentine's Choco-coated Chair, Nue Choco-party Chair, and Kenshin Choco-party Chair. Love is in the air! Find your valentine with the Valentine's Gift Chair, Couples Army Poster Chair (F), Couples Army Poster Chair (M), and Popular Student Locker Chair. Being single can be lots of fun, or it can be lonely. Show how you feel with All the Single Ladies, In Your Face Couple Chair, Single King Chair, Singles Life, and Nonchalant Loner Chair. Spend time with your other half with couple chairs! When you and a friend sit next to each other in these chairs, a special effect appears. Check out the Amorian Loveseat, Half-Heart Chocolate Cake Chair, and Chocolate Fondue Chair. More couple chairs are available! Enjoy the Sweet Cake Couples Chair and Gondola Pair Chair. Have some quiet time to contemplate with the Spring Flower Corsage Chair, Heart Cloud Chair, Beautiful Music Chair, and Cherry Blossoms Chair. If multiple players sit near in each other in the Cherry Blossoms Chair, an effect will appear. Celebrate the power of pink with Marry Me, Pink Seal Cushion, Pink Teddy Chair, Pink Bean Chair, and Baby Cradle Chair. Take time to sit in the Angelic Adoration Chair, Chocolate Soup Chair, Happy Photo Frame Chair, and Hilla & Magnus. Valentine's Day means new mounts too! Check out the Spirit Army Mount, St. Bernard Mount, and Crystal Aura Mount. These mounts are available as permanent versions. Get around in style with the Bling Bling Heart Mount, Pink Chu Chu Whale Mount, Pink Sheep Mount, Strawberry Cake Mount, and Mystical Butterflies Mount. These mounts are available as permanent versions. Take a ride with the Lovely Scooter Mount, Romantic Spring Mount, Pink Bean Balloon Mount, Spring Breeze Mount, and Together with Angel Mount. These mounts are available as permanent versions. Enjoy the night with the Moon and Stars Mount, Starry Night Cloud Mount, Bunny Moon Gazing Mount, and Flying Bed Mount. These mounts are available as permanent versions. New mounts have also come to Andersen's Box! Get the Spirit Army Mount, St. Bernard Mount, Crystal Aura Mount, Bling Bling Heart Mount, Pink Chu Chu Whale Mount, Pink Sheep Mount, Strawberry Cake Mount, Mystical Butterflies Mount, Lovely Scooter Mount, Romantic Bike Mount, Pink Bean Balloon Mount, Spring Breeze Mount, Together with Angel Mount, Moon and Stars Mount, Starry Night Cloud Mount, Bunny Moon Gazing Mount, and Flying Bed Mount.These mounts are all available as 90-day versions. January 24 to February 6 in the Appearance category in both Reboot and non-Reboot worlds. Check out the Male Hairstyles available now: Doofus Hair (NEW! ), Dannie Hair (NEW! ), Hairspray Hair, Princely Bob Hair, Samurai Ponytail, and Sharp Cut. Check out the Female Hairstyles available now: Star Student Hair (NEW! ), Beauty Hair (NEW! ), Cammy Hair, Mont Blanc Hair, Love Me Hair, and Sylph Hair. Check out the Male Face Styles available now: Glum Face (NEW! ), Power Dude Face (NEW! ), Look of Evil, Sulky Look, Bright Face, and Surprised Face. Check out the Female Face Styles available now: Maui Face (NEW! ), Xia Face (NEW! ), Glassy-Eyed Face, Intelligent Eyes, Serene Face, and Bright Face. January 24 to February 6 in the Special Promotions > Limited Time category in non-Reboot worlds only. Take home the Heroes of Maple pets! Pick up Lil Evan, Lil Aran, Lil Phantom, Lil Mercedes, Lil Luminous, and Lil Shade—or take home all of them! The individual pet package comes with an equip to wear, yummy pet food to eat, a Pet Name Tag, and some useful pet skills and scrolls. January 24 to February 6 in the Special Promotions > Limited Time category in both Reboot and non-Reboot worlds. Become a toasty warm bear with these permanent outfits! January 24 to February 6 in the Special Promotions > Limited Time category in Reboot world only. The Heroes of Maple pets are ready to accompany you on your journey! Pick up Lil Evan, Lil Aran, Lil Phantom, LilMercedes, Lil Luminous, and Lil Shade and let these little buddies join you on your adventures in Reboot World!